It’s proven: The No. 1 greatest barrier to recycling is inconvenience. What does that mean? It means that despite people’s interest and support in community recycling programs, unless you make it as easy as, well, throwing something into the trash can, it’s another example of “easier said than done”. Hopefully a new Park Recycling Grant received by the Downtown Missoula Partnership this week will help change that. Missoula is one of 51 communities across the cou ntry that will receive new recycling bins for its public parks under the grant, with a goal of making recycling more accessible (read: convenient) for people enjoying the outdoors. 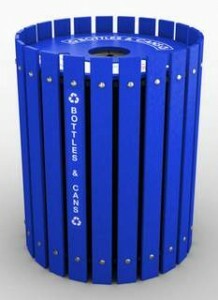 Will Greenway, community development manager for the partnership, said Missoula’s new bins will be set up in Caras Park. “We are incredibly excited to enhance our recycling initiatives for our community,” Greenway said. The grants were awarded by the Dr Pepper Snapple Group as part of its Keep America Beautiful program. The program will fund 900 recycling bins in total this year, bringing to 3,400 awarded to affiliates, local governments and other community organizations in 28 states in four years. A recent survey demonstrated that while 92 percent of Americans indicated they keep a home recycling program, only 19 percent reported they recycle in public parks. “With the help of Dr Pepper Snapple Group, we’re transforming public spaces into beautiful places by making sure more recyclables are being placed in proper receptacles in our parks and natural areas,” said Brenda Pully, senior vice president of recycling for Keep America Beautiful. For more information on the Park Recycling Grant Program, click HERE.